Looking for an Albuquerque web design company? TGS Web design is a full service website design, SEO, internet marketing and web hosting company serving the Albuquerque, Rio Rancho and surrounding areas. We offer reliable web development services at affordable prices for all types of website design, website maintenance repair, web hosting and internet marketing. TGS Web Design in New Mexico has become the most trusted long term partner in helping local and national business succeed online. Providing affordable web design services with unmatched quality in design, functionality and service. TGS Web Design is a local New Mexico web design company serving; Albuquerque, Rio Rancho, Santa Fe and surrounding areas. Call us today for a free web design consultation 505-903-4326. Let us provide you with a free no obligation consultation for a ultra modern mobile friendly web design to insure that your website presentation is consistent across all screen sizes, devices and browsers. We build new mobile friendly websites or can redesign old sites to be mobile friendly for the modern era of connectivity. With mobile devices accounting for almost half of all web traffic, you can’t afford to look for the cheapest web design company when it comes to developing a dynamic mobile web design. Our professional Albuquerque website designers can build a uniquely creative custom web design that will provide a better overall user experience for your customers. We are website design geeks that love what we do and are comfortable with pushing the “industry norms”. We’ll be as creative as you want us to be with the presentation and website design. So don’t let that next great idea slip away! Get in touch with us today for a free web design, website redesign, SEO or web hosting consultation. We look forward to answering any questions that you have about our web design, web marketing, website hosting services. We are a local Albuquerque web design company and support local business for both Albuquerque and Rio Rancho. Our top priority is providing each and every client with quality service, attention to detail and prompt support during the website development process. With over 11 years experience building custom websites for small, medium and large business clients in the Albuquerque New Mexico and surrounding area, TGS Web Design is an experienced and reliable high quality web design company that can get the job done within budget, and on time. With a local office in Rio Rancho we are always just a phone call away. With an online 5 star rating you can be sure that TGS Web Design makes for a strong partner in taking your message online. We are committed to providing excellent customer service, top quality website design, reliable website hosting and results driven SEO services to all our customers in Albuquerque & Rio Rancho, New Mexico and around the world. Small business owners are always short on time when it comes to updating their website and keeping it modern, fresh and secure. At TGS Web Design we understand this problem and want to help lighten the load. We have put together monthly website maintenance plans for any size website to help keep your website up to date and running smoothly. Our monthly website maintenance plans cover all the details required to keep your website up and running and looking great. 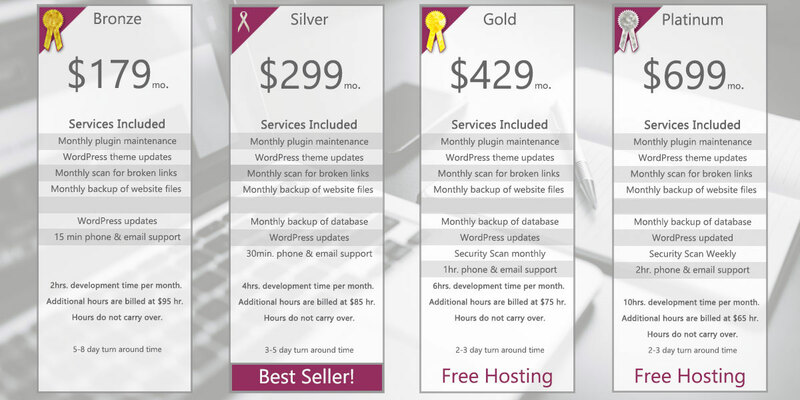 Below are the monthly website maintenance specials and website maintenance plans that we offer.